After Rhea pits Kara against Superman himself, she takes the only option she can see: challenging the alien queen to single combat to save the planet. When the Luthers offer a deadly back-up plan, Supergirl faces the possibility that her future with Mon-El may be the price of saving her world. Last edited by GateWorld; May 25th, 2017 at 09:20 PM. Loved the quips between Cat and kara about "tell supergirl to get on olson about his guardian role.. "
AND loved her quip to herself at the end "You go get em, supergirl".. SO SHE does know but is ok keeping it a secret. Really hated that Mon-el had to leave like that, but was surprised that Kara actually pushed the button.. Especially as we've seen time and time again when it comes to family/loved ones, they often WILL not do the RIGHT thing. Not the first time silver kryptonite has been used. In Smallville, Brainiac used it to make Clark paranoid. And as they kept mentioning, Daxam was in the same system, so it makes sense that a lot (relatively speaking) of chunks of Krypton would have ended up there. I thought they said we were to get our hankies ready? For what exactly? Thank you mummy Luthor and Lena for making that Lead contraption I would pardon Lillian for all crimes just for this alone Lena getting one over on her mum is always good to see Liked seeing Winn and Lena working together again. Would like to see them interact more and be all nerdy. 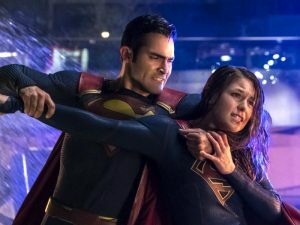 How come Kara is stronger than Clark? I'm not sure how Kryptonians work but I would have thought maybe Clark would have been stronger with him being on Earth longer and soaking up the rays of the yellow sun longer and also fighting as a super much longer too. And I thought Daxamites couldn't fly, just leap really really far. They could have done without the bit at the end with Alex and Maggie, seemed like they just shoved it in there last minute to fill up space. Well bye bye Mon-El Now maybe just keep Kara single for a while instead of having every guy that looks at her fall for her, or if you want to give her a love interest maybe go for someone that actually trusts and respects her and listens to what she says that would be great. Oh how did the kryptonite get into the bloodstream? And does it have to be visible for it to have an affect? Oh and what's the story with the baby at the end? Last edited by Linda06; May 23rd, 2017 at 11:54 AM. That's twice I've missed something at the end of this show 'cause when they start the relationship crap I head for the kitchen. Now i know Jon didn't know of that as he was comatose for it all, but you would think the OTHERS would know about it..
After the lead got released the Daxamite soldiers got beamed back up to the ships. Why didn't they beam up Rhea? And why did it take longer for t to hsve an affect on Mon-El? Was it because he was under the yellow sun for longer? Also wouldn't the lead have some kind of effect on humans? Will the lead eventually dissipate or is it in the atmosphere for good? I rather suspect they are going to be fighting with their version of the EPA for quite some time. They specifically said it was too low a concentration to effect humans and that Mon-El would be able to last longer because of the yellow sun, but I'm not sure about why Rhea stayed behind. Ah right, there was so much going on I didn't catch some things. I figured he lasted longer because of the length of time he's been on Earth compared to the others. Rhea staying behind was kinda odd. But at least Mon-El is gone, that pleases me and there will be some angsty Kara for a while. Who is that baby at the end of the ep? That's BS. At the beginning yes but Mon-El hasn't been a coward at all in the back half. Well being we have not seen any evidence of repremands for all the other things they have done illegal (IMO) what makes you think they will fear anything the EPA does/says>?